In a world filled with bodycon dresses and tiny, tight skirts, you can imagine how refreshing it was to stumble on an online store filled with endless feminine silhouettes. Reformation's design mission is to make effortless silhouettes that celebrate the feminine figure. The design process starts with us thinking about what we really want to wear. A sketch becomes a dress in less than a month, so we're designing and making what you want to wear now. (Most fashion is designed 12-18 months in advance). We make our clothes from three different types of materials: 1) new sustainable fabrics, 2) repurposed vintage clothing and 3) rescued deadstock fabric from fashion houses that over-ordered. We believe the perfect fit is the most important part of our clothes. We spend hours fitting on different bodies and have a meticulous approach to our fits. Our main range is fit on multiple women that are between 5'6 and 5'10. We also have a petite collection which is designed for ladies 5'4 and under. These capsules based on body types are just the first steps in our quest to make sure women of all shapes and sizes can wear Ref (and look damn good doing it). Bodycon dresses are cool and all, but there's something endearing about a dress that compliments one's entire body, not just the curves on display. As I scrolled through the various looks in Reformation's catalogue, the number of dresses I desired to add to my shopping bag kept adding up. These aren't what I consider budget friendly prices so I had to be selective and find that one perfect dress. Unfortunately, many of the dresses I wanted were sold out. If, this Westwood Dress was still available, I just might have splurged. Short dresses with sleeves are my one weakness. And this one made my heart flutter the moment my eyes landed on it. I've visited Reformation several times since first discovering it. One thing I've noticed is their dresses move fast. Several items I've lusted after were sold out within days of my last visit. 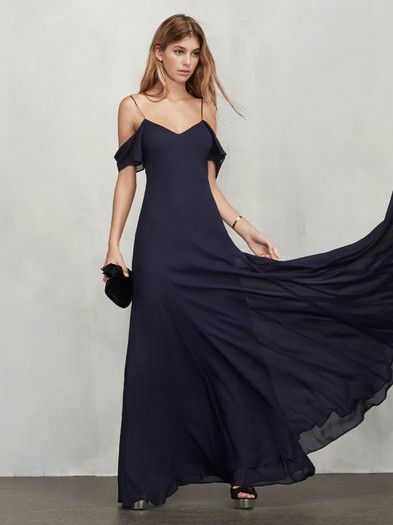 If you're looking for a show stopping, classic dress to wear to your next holiday party, maybe give Reformation a look. That pink dress is beautiful but what kind of bra do you wear? Thank you Ashley! Merry Christmas to you too!